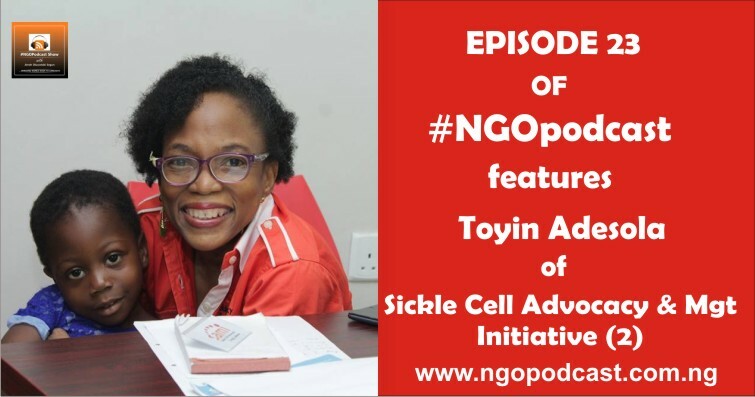 On the previous episode of NGOpodcast show which was episode 22, the host, Jimoh Oluwatobi Segun started a conversation with Toyin Adesola, the founder and the executive director of Sickle Cell Advocacy and Mgt. Initiative, A non-governmental organization which is based in Lagos state Nigeria. The organization focuses on advocating for sickle cell patient and provide them a support. She informed the listener about her organization and their goal. She educate us on sickle cell, the cause, prevention and how It can be curbed/reduced. She also shared her story as well, as a Sickle Cell patient for over the 52years. You should listen to that episode! On this episode, Toyin Adesola will be telling us more about her organization, their projects – both past and present project, also she will be sharing some fantastic tips that helped her as an NGO leader for over the years.